PHILADELPHIA (CNS) — Anyone who attended the pope’s visit to Philadelphia Sept. 26-27 could not help but notice the massive security apparatus that was set up around the events. The U.S. Secret Service, FBI, Border Patrol, Transportation Security Agency and a cornucopia of other government entities, including the Pennsylvania National Guard, patrolled the streets and manned checkpoints. Right in the middle of everything were the officers of the Philadelphia Police Department, the organization usually responsible for keeping the streets safe on a day-to-day basis. What was the papal visit like for the average cop on the street? Officer Rollie Ramos knows. On Sept. 27, after the closing Mass that drew hundreds of thousands of people to Benjamin Franklin Parkway was over, the officer was directing traffic at Broad and South streets, the border of an area known by locals as “the box.” After South Street, a section of the center city was closed to all vehicles in a squared-off area extending in all directions. A large stream of people came up to Ramos’ corner in waves as they headed to tour buses or other areas beyond the barriers. “This is the most people I’ve seen in the last two days,” he said, in between directing pedestrians to cross and dealing with vehicles making turns. Many of the city’s cops put in a lot of extra hours before and during the pope’s visit — Ramos himself was in the middle of a long shift on the night of the Mass and had worked 10 p.m. to 8 a.m. shifts in the previous few days. “I know a lot of cops who were frustrated by the amount of hours they would be working, but because of the type of event it was, they were also excited,” said the officer. The temperament of the crowd the night of Sept. 27 was a little calmer than it would have been if a concert or sports event was letting out, according to Ramos. The officer greeted pedestrians, including a man with a T-shirt in memory of baseball player Yogi Berra. “I like that shirt!” he called after the man, who turned back, smiling. Cab drivers jetted past the corner, and the officers helped hail a taxi for an older woman who didn’t want to walk anymore. A tour bus was pulled over to the side of the road, venting fumes that were less than pleasant. When the bus driver did decide to pull out, Ramos and other officers made sure to direct cars to avoid accidents. It was a street corner ballet with the police directing the dance. People, cars, buses, cabs and bicycles moved in rhythm to the changing street lights and the sounds of engines. Street vendors pushed carts with pope merchandise over the curbs, hoping to make a few more sales before “pope fever” broke and the city was back to normal. Despite the general calmness of the crowds, the policing situation during the pope’s visit did pose challenges to the patience of everyone involved. Eventually the VIPs, one of whom performed at the Festival of Families the night of Sept. 26 on the same stage as Pope Francis, did get where they were going. It just took a little longer, according to the officer. 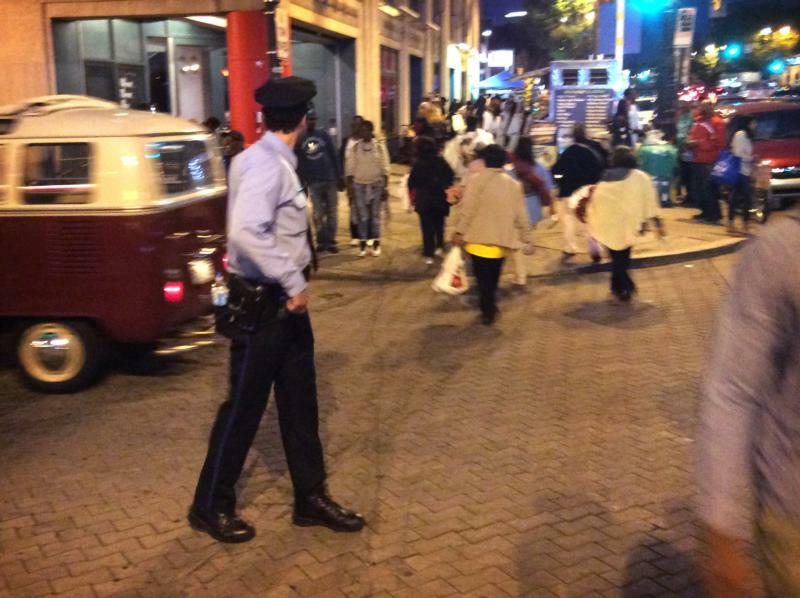 Everywhere the pope went, Philadelphia police were among the security details lining his path. So what role does faith play in the life of a cop? “When it comes to religion, I know a lot of cops who are faithful, but they don’t talk about it,” said Ramos. Personally, the officer describes himself as someone who is “not a churchgoing person,” meaning he’s not at Mass on Sundays. However, he is Catholic and does believe in God. Ramos was happy the pope came to the city, but was looking forward to a nice long nap once his shift was over the next morning. “Everybody’s going on three to four hours sleep,” he said. Russo is editor of The Witness, newspaper of the Archdiocese of Dubuque. He’s originally from Philadelphia.